Oh gosh, this one hit super close to home. I had a relationship just like this and it still burns and stings every once in a while. Especially when a book so poetically written stirs up old memories. 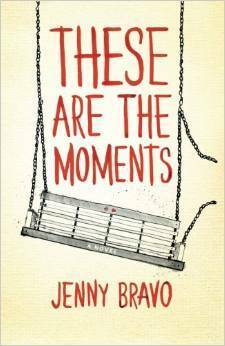 Jenny Bravo takes a story that most people have expectations for and turns them on their head. Honestly, if I hadn't lived through it, I would have been left with a giant wtf at the ending. I'm also sitting here trying to not make this one too personal but it felt personal. It felt as thought I was reading my story from an outsiders perspective. The writing of the "Then" and "Now" had the potential to make me not like the book, but they were so cleverly linked together that I enjoyed them and was actually anticipating the jump between the two so I could see what was next in store for Wendy and Simon. I liked the parallel between Wendy and Claudia -- and their relationship as it developed over the course of the story. It is stated that they aren't really close because of the age gap, but heartbreaks bring everyone together and that is what happens for these two sisters. Vivian and Reese were both so interesting and I was fully invested in each of their stories as well. I was rooting for everyone to get what they wanted. It did feel as though Vivian was one end of the spectrum of Wendy's life at the beginning of the story and Reese was the other, while Wendy was stuck somewhere in the middle until she made a choice and created an entirely new path for herself. I don't think I can discuss the relationship between Wendy and Simon and do it justice for why it was so realistic and depicted how things build up to be so much and then just fizzle out while still lingering. But it made me cry and let out things I have been holding onto for years. And it is important to have hope and to hold your chin up high and let go as much as possible. It is hard to do that sometimes when you don't know what will happen, especially if you are settled into a good routine. But it is possible and sometimes it is necessary, and Wendy shows the reader that and so much more. Overall: 4/5 stars. This one really hit home for me. It was like getting a glimpse into how the past six years of my life have played out and made me realize that maybe it is okay to finally move on.